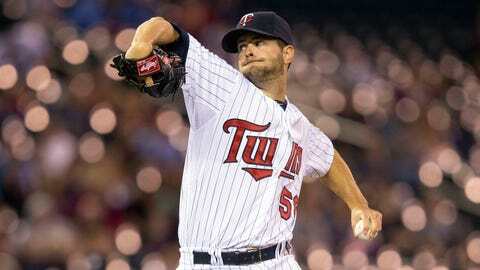 The Twins' abundance of talented youth has assistant general manager Rob Antony excited about the franchise's future. 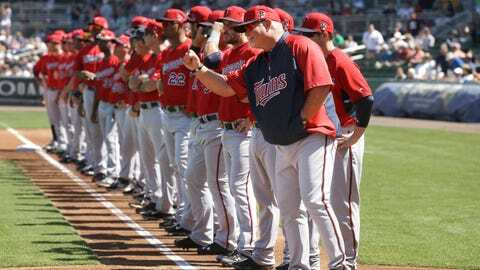 FORT MYERS, Fla. — The Minnesota Twins are now a week into Grapefruit League games, but there are still more than three weeks to go before the team breaks camp to start the regular season. Between now and then, Minnesota’s front office will have to make several tough decisions to formulate a 25-man roster for Opening Day. A good chunk of that responsibility falls on Twins assistant general manager Rob Antony, who has filled in while general manager Terry Ryan continues to receive treatment for cancer back in Minnesota. FOXSportsNorth.com sat down with Antony for an exclusive one-on-one interview to evaluate the Twins’ spring training up to this point and a look at what still needs to happen before March 31. FOX SPORTS NORTH: How has this spring been different for you with Terry Ryan not here? ROB ANTONY: "It’s definitely different. All the things that you deal with and I probably didn’t notice Terry having to deal with, a lot of the media things as well as communicating with (manager Ron Gardenhire) and different players in different situations and everything and just kind of looking at things from a broader perspective rather than just coming in and worrying about getting my zero to three contracts done. Then you just go to the games. Now you watch them with a little bit different perspective, I guess, focusing probably more so on the decisions that need to be made and the players that are a little bit on the bubble or that are in competition more so than taking it in overall. I think I spent more time in past springs. There were some times I was actually responsible for covering Boston and also just when we’d go see other teams I was as interested in seeing some of their players and evaluating some of them as ours. I think I had probably put more emphasis on our players and on our team and trying to figure out what the next step is and where we go from here." FSN: I know you’ve been talking a bit with Terry this spring. How much of the communication has been baseball-related? ANTONY: "Not terribly a lot. As much as anything when we talk, we talk about specific things, some of our own players. He’s had some questions about this guy or that guy, and, ‘How’s this guy look? How’s he handling himself? What kind of shape is this guy in?’ But as much as anything, it’s been more of a conversation about how he’s feeling and how he’s doing and everything. I’m more concerned about his health than anything. I think he’s feeling better every day. I think he’s kind of chomping at the bit to get back to some semblance of a normal routine. That’s all positive." FSN: Has he talked about wanting to get down here at some point this spring? ANTONY: "We haven’t talked about that too much. He’ll just tell me, ‘I’ve got another appointment here and I’m going to find out my schedule here moving forward, when we’ll start radiation,’ different things like that. I don’t think until he knows all that stuff, I don’t know that he can really plan on anything and what he should and shouldn’t do. He’s going to make sure he checks with the doctors before he makes any plans or has any ideas of going anywhere or coming down here or anything." FSN: It’s only early March, but what have your impressions been of how things have gone so far this spring? ANTONY: "The things that we talked about over the course of the winter, some of the things that we need to do when the season starts, we’re 4-2, which doesn’t mean much of anything in spring training. But in those four wins, we scored seven runs (in an inning) once, we’ve scored four runs in an inning a couple times, we scored three runs in an inning about five times, I think. Those were all some of the things that we talked about. We need to take advantage of our opportunities. In (Tuesday’s) game, it was absolutely in a nutshell last season. The Marlins committed four or five errors and we didn’t take advantage of anything. We left runners in scoring position, took poor at-bats when we had chances to do some things. Those are all things that we know we need to improve on if we’re going to win games, and we have won some games out here. "We haven’t committed errors. I think we’ve only made errors in one game this year. So we’ve played good defense, and for the most part the pitchers have done a nice job throwing the ball over the plate, so that’s all been encouraging. And with the exception of the (Miguel) Sano injury and (Pedro) Florimon’s appendectomy, everyone’s remained pretty healthy, so that’s been positive." FSN: One of the big questions this spring is that fifth starter spot. What factors will go into making that decision as far as what you’re looking for between now and the end of spring? ANTONY: "Each guy’s a little different. No. 1, (Vance) Worley showed up and he was in good shape, so he’s given himself a chance and he’s throwing the ball well. (Scott) Diamond, you’re looking for a little better command and control. He’s only had a two-inning stint so far. . . . (Samuel) Deduno showed what he’s shown so much in the past. Unfortunately, he was 44 pitches deep in less than two innings (Tuesday). That’s always been a challenge for him. If he’s going to be one of the starters, you can’t have a guy at 100 pitches in the fourth inning. It just wears out your bullpen. So we’ll see. That’s one outing for him. But those are the three guys. I thought (Kyle) Gibson threw the ball very well the other day. He had a very good angle and sink on his fastball and threw strikes. His control’s probably better than his command right now, but it’s early in camp. Kris Johnson, another guy that has a chance, has thrown the ball well, albeit in a little bit shorter stint. He just went an inning last time but he’s done a nice job, as well." FSN: Any young guys jumped out at you so far in camp? ANTONY: "I think what I’m most pleased about is that everyone’s handled themselves well. (Max) Kepler, (Jorge) Polanco, all those guys. (Byron) Buxton’s done a nice job, gone about his business the right way. Kennys Vargas. Sano was doing great, doing everything we were hoping. The throwing program and everything was going well. He showed his power (in) BP and everything. That was a shame that it didn’t work out. . . . And the pitchers, too. I haven’t mentioned (Logan) Darnell and (Alex) Meyer and (Trevor) May, but they’ve done a nice job. I think everybody, from the coaching staff to the people up here, are really pleased with the way guys have gone about their business. They’re prepared. They came in in good shape and they’re ready to go, and they’re competing. Some of these young players lit a little bit of a fire and caught the attention of some of the veteran players or the guys that have been around that, ‘Wow, these guys are legit. We’ve heard about them, but they’re not just hyped prospects or something. These are pretty good players.’ That gives the coaching staff a little bit of energy and excitement, too, knowing that we have some guys that aren’t that far away from coming up and helping us." FSN: We’ve talked about Buxton a lot. Has anything surprised you about how he’s handled his first big-league camp? ANTONY: "No, not really. It kind of goes hand in hand with what we saw last year where he’d get off the bus and there’s guys waiting for his autograph. He signs autographs and just goes about his business like that’s part of the job. I think he knows how to handle the attention without it being a distraction. It doesn’t go to his head and it doesn’t affect the way he goes about things. He’s a very humble person who doesn’t take anything for granted. You can tell he’s been raised right, that he’s a good kid. He hasn’t lit it up out here, but it also hasn’t brought him down. He hasn’t doubted himself. He doesn’t lack confidence. He has confidence, but it’s not an arrogance. It’s a pretty good combination to have." FSN: Does Joe Mauer look like a guy who played catcher for 10 years, or like someone who’s played that first base position for a while? ANTONY: "The few games that he’s been out there, I didn’t have any doubt that Joe was going to be able to handle that. He’s such a good athlete that I think he’ll be a well above-average defensive first baseman. I still truly believe that the wear and tear that he’s not going to have to go through and all the treatment and all the time in the trainers’ room just to get himself able to play in games is going to allow him to focus more on preparing to hit and to play the game and to be successful. I honestly believe you’ll see a spike in his offense." FSN: At what point in camp do players’ spring statistics play into the equation, or are those even taken into account? ANTONY: "Not too much to me. I have more interest in keeping track of how many quality at-bats they took, how many hard-hit balls they had. Pitchers, their situations, how they handled different situations. I don’t think the stats mean much in spring training. Last year, Kevin Correia didn’t do much at all and everyone was worried about him, and he just went out and was our most consistent guy. Aaron Hicks was the talk of spring training and the season started and he struggled. I think spring training means different things to different players. If you’re competing for a job, it means something, so you want to perform at your highest level. That’s what we have to go off of. It’s a competition, but at the same time you also have to look at it and sometimes a guy’s hitting .111 but you go, jeez, he hit three balls on the screws today and he had nothing to show for it, so you look beyond the numbers a little bit. He took good at-bats and he gave himself a chance. He didn’t chase balls out of the zone and he hit balls hard and had good pitches to hit." FSN: What’s the biggest question this team has to answer by the end of spring training? ANTONY: "We’ve got to decide our fifth starter. We’re going to have to figure out our center fielder. Gardy’s going to have to figure out how his lineup’s going to lay out and what he wants to do and who’s going to be a leadoff hitter for us. We’re going to have to out that utility role. So each one has its own unique set of circumstances. Some of it involves players that are out of options, some of it involves guys who aren’t on the roster and we’re going to have to find a place for some guys on the roster that might make it. It’ll be interesting to see Matt Guerrier’s getting healthy. He’s going to make a run at a roster spot and a spot out of the bullpen. We’re going to have to figure out what to do with the guys who are out of options. That’s some of the bigger decisions to be made. Sometimes the players make them for you, sometimes injuries make them for you. You’d love to be in a situation at the end of the spring where everybody’s healthy, everybody did a good job, and now you’ve got to make some tough calls."